BELGAUM: The 2nd Chaitra Nadgouda Memorial Belgaum Open All India Chess competition started today at Varerkar Natyagraha Tilakwadi. Total of 250 Chess players Bangalore, Mysore, Shimoga, Bijapur, Dharwad, Chitradurg, Gadag, Haveri, Uttara Kannada, Koppal, Sangli, Kolhapur and Goa have participated in the event. 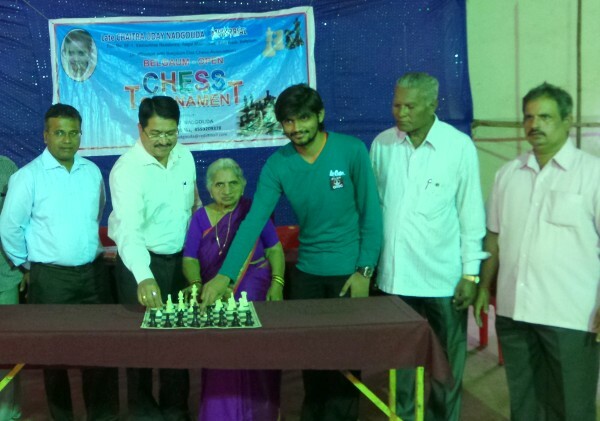 The event is organized by Abhay Nadgouda in association with Belgaum District Chess Association. Total prize money of the tournament is Rs 50,000/-. Chief Guest SudhirDarekar and International Chess Player NiranjanNavagund inaugurated the event by lighting of Lamp and playing Chess. Belgaum District Chess association President Prof. Dattatray Rao, Secretary Nilesh Bhandari, Dr Suresh V Desai, Leela Wamanrao Nadgouda, M N Deshpande, Anil Kolar Tournament Secretary Abhay Nadgouda were present. Chief Guest and International Chess Player Niranjan Navalgund displayed some fine techniques of Chess. The event started in all the different categories after the inauguration. The main event will be held in Swiss league format. The final result will be derived on tomorrow evening followed by prize distribution ceremony. Is today any chess tournament in Belgium? Thanks for the coverage Udayji. All The Best to all the Indian Chess Players !Who are all participated in the 2nd Chaitra Nadgouda Memorial Belgaum Open All India Chess competition. .
And Niranjan! he is a wonderful player! We can’t describe him wid jst one word.! Dynamic personality.